Click to learn how to have your Memorabilia Autographed by Goose Gossage. 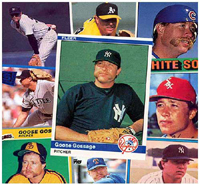 Welcome to the official website of Goose Gossage. This is a fun, interactive site for fans of all ages. Learn about one of baseball's most dominating pitchers and relive some of baseball's greatest moments. And don't forget to visit our store to purchase your authentic hand signed memorabilia to add to your collection. To find out what people are saying about Goose Gossage in the HOF in 2008. Click to Read, Listen, and View!